The uniqueness of the temple in Nusa Penida Island Bali, come and travel to Nusa Penida as a New Paradise Island of Bali. 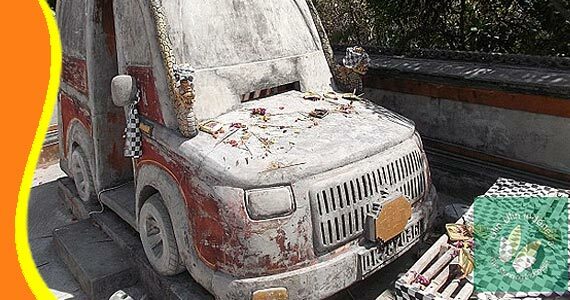 There is a unique temple in Nusa Penida that resembles a car. The temple called Paluang Temple (Pura Paluang) or Car Temple (Pura Mobil). 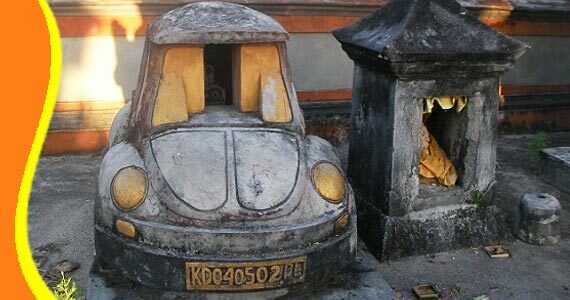 There are 13 shrines (pelinggih) and 2 of the shrines in the form of miniature Volswagen Beetle and Jimmy Cars. These makes Paluang temple to be a very special temple in Bali. And because its different from the existing temple in Bali. The History of Paluang Temple Nusa Penida. The existence of Pura Paluang itself no one knows for sure when the founding of this car temple. However, according to the information Pengemong Pura (Temple Guards) and Jero Mangku (Temple Priest), explains that long time ago there were a citizen who opened the land to be garden in this place and found a large stone that moved. The next day the boulder moved back to where it came from. This is repeated again until the residents get a clue to establish Shrines place that is on a steep cliff. 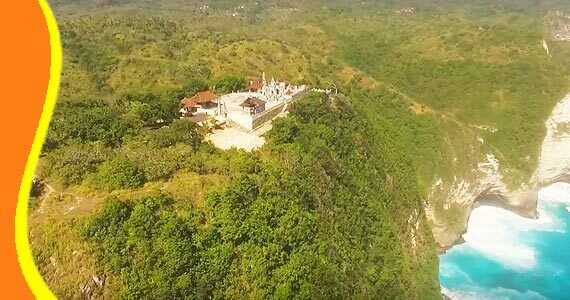 And therefore called PURA PALUANG (edge of the cliff). This temple is located in the southern part of Nusa Penida near to the beach. The temple with Shrines Cars is the only one in the World. To go to Paluang Temple from the port of fast boat Toya Pakeh Nusa Penida, takes about 1 hour drive by local car. The road taken was winding because in Nusa Penida is hilly land. On several roads leading to the temple, a damaged and perforated road is found. And the terrain is steep and steep. Bushes and trees can be seen along the way. 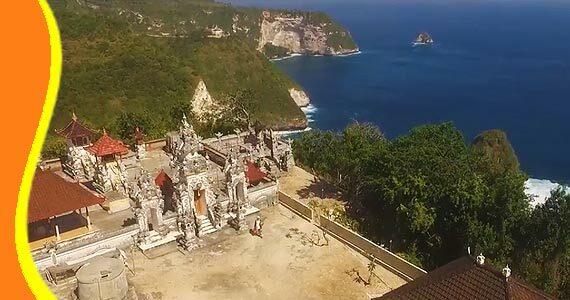 The location of this sacred temple is located in the western part of Nusa Penida Island. Above the cliff beneath is a deep chasm. Similar to Pura Luhur Uluwatu Temple in Bali. Located in Banjar KarangDawa, BungaMekar Village, Nusa Penida Sub-district, Klungkung Regency, Bali. 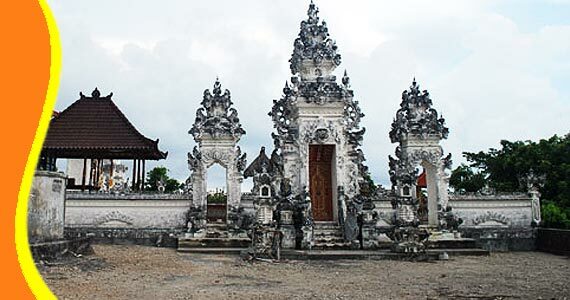 Arrive at Pura Paluang Temple or Pura Mobil Temple Nusa Penida, you will be amazed by very beautiful scenery around. Ocean and small islands around the temple area, really interesting to see. 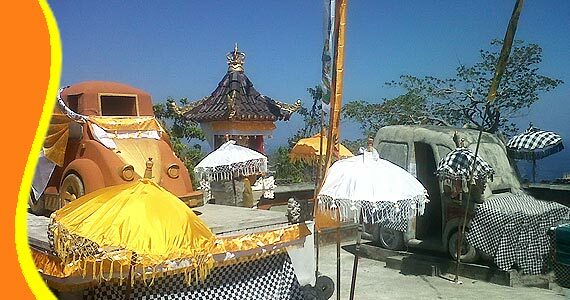 And this temple is located adjacent to the attractions of Pantai Kelingking Beach and Manta Point. This temple located near the Kelingking Beach, an amazing scenery around. Reliable mystical incidents or not, often occurs in this Paluang Temple. Sometimes a car horn will be heard at night. And often, heard the roar of cars coming, but not visible. For those who come to the Pura Paluang Temple and neighborhood, should be polite and speak good. Because sometimes bad things will happen to you if you misbehave in this place. It is advisable not to piss haphazardly, say dirty, or misbehaving. Karang Dawa Village, Nusa Penida, Klungkung Regency, Bali - Indonesia. Get a Bali Transport from your stay (Contact us for Cheap Bali Transport). Bali Paluang Temple, Bali also can arrange a Free Transportation including into your Trip Package. Paluang Temple Bali can be combined and implemented in conjunction with other activities Trip or Tour in the same direction. “Very unusual, unique temple (Cherty - Australia)"